Bookittyblog YA Book Reviews: Fractured by Sarah Fine Review and GIVEAWAY! I was so scared of reading Fractured. I just knew something was going to happen to one of my favorite characters ever. My gut told me I should be afraid, or Alexa from Colletctions just scared the hell out of me. It can go either way. I was so terrified I couldn’t touch the book for almost a month. Then I got over my fears a jumped in. I didn’t have to be afraid because WOW, Sarah Fine knows what she’s doing. I was so impressed with her writing and how it sucked me in. Once you start reading Fractured you won’t be able to stop. One of the things I liked the most about Fractured were the new characters. Some I adored and some I wanted to strangle with my bare hands. I think that’s what Sarah wanted me to feel. Because OMG. In one scene, I wanted to kill someone. AH! I was so mad! I wanted to get inside the book and slap some sense into that character! I love when I feel strong feeling toward characters. It doesn’t matter if it's in a positive way or negative way. I just love that I feel that they are real. I feel that Fractured was a bit scarier than the first book. The Mazikin were bolder and terrifying than in Sanctum also. Every time one of them was mentioned in the book my hair stood on end. With everything that was happening in the book I never saw the twist involving one Mazikin coming. It was kind of a WTF moment actually. It just broke my heart. I can’t forget to mention one of my favorite fictional couples, Lila and Malachi. Sigh… Malachi is such an amazing character. Lela is also amazing and strong. We don’t see main characters like Lila in books that often. That makes me love her even more. Fractured was amazing! The ending was perfect, and I can’t wait to see what’s going to happen in the next book! Too bad we have to wait. But I’ll wait as long as I have to. If you haven’t read Sanctum you need to ASAP!!! You don't want to miss out on a great series! I'm giving away 4 e-copies of Fractured! If you win and you haven't read the first book in the series (Sanctum) you have the option of picking Sanctum instead of Fractured. This Giveaway is INT'l and will end 11/11/13. Good luck! I'm glad you loved this one. Another book for my ever-growing TBR list! YAY! Put it on top of your TBR list! So worth it! I have the first one and I still haven't gotten to read it. I've heard nothing but great things, so I'll definitely have to pick it up! Great review! You HAVE to read it!!! I hope you like it! When is this out? I can't seem to get motivated to read it on my Kindle. I have the ARC there but I kept putting it aside. I'm scared now too! Eeep! Don't be scared!!! It was so good!! And it's out now! haha I'm always scared to read the sequel of a book I really loved. It's so rare that it just doesn't live up to it you know. I'm glad this one did though it sounds like a really good follow up. I love when new characters are introduced and you get to like them as much as the 'originals" :) Great review, chickie! The cover for Fractured looks amazing, thanks for your review, I'm glad you really enjoyed it! I haven't read Sanctum yet but I'm going to go check it out now. Great review! I hope you read it and enjoy! It's such a great series! Very helpful thank you. I haven't begun this series yet. You are welcome! I hope you check it out! 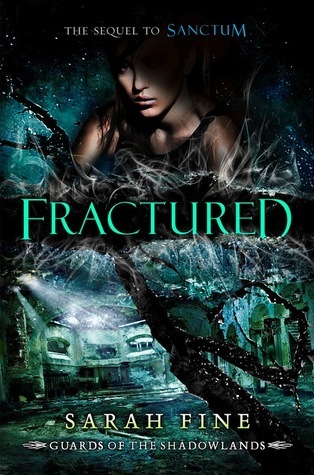 I can't wait to read Fractured! !